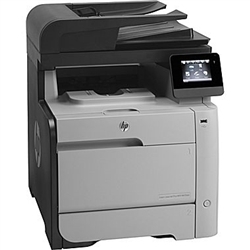 The HP LaserJet Pro M476dn can print, copy, scan, or fax quickly and easily. This four-in-one printer can scan documents directly to email, network folders, or the cloud, and it prints up to 21 black-and-white or color pages per minute. Tackling big jobs is simple with a 50-page auto document feeder and automatic duplexing.